Hambone kicks things off with a quick introduction (00:17). The guys get right to it and talk about a programing board game called Colt Express that they played the previous night (01:20). The focus of the episode is West End Games’ Star Wars RPG (06:08). Discussion starts with how completely Star Wars has penetrated popular culture (06:12) and Hambone gives a quick history of the game (06:48). Stu breaks explains how the RPG kept Star Wars alive. (07:40). The Ewok Movie comes up (08:20). Stu theorizes that the initial appeal of the Star Wars RPG laid in the fact that the books gave you access to more material from the movies (09:28). Stu explains the basics of the system (10:31) and explains how the game gave birth to the Expanded Universe (11:13). Timothy Zahn’s Thrawn Trilogy comes up (11:53) and Stu explains how those books paved the way to the larger Star Wars’ modern pop culture explosion (12:37). The Science Fiction Book Club comes up (13:22). Hambone runs through some of the publications dates and cover art for the various editions of the rules (13:50) and Stu voices his disappointment in the design and illustration in the third edition (14:18). The guys say their good-byes (31:13). In this episode, we break format to give you some gifts suggestions of the holidays – whether you give them to your favorite tabletop playing pal or add them to your Christmas lists is entirely up to you. First up, the Dragon Heist platinum edition (02:15). We chat about dice (07:00). Artisan makes very nice dice. 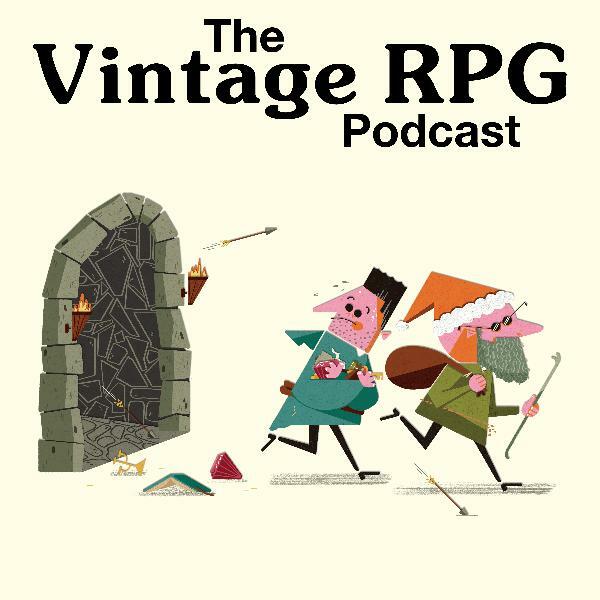 We talk about Wormwood dice vaults and accessories (09.00). Stu laments that he didn’t own the Masks of Nyarlathotep prop set from the H.P. Lovecraft Historical Society. It comes in two flavors, regular and holy crap that is expensive (09:45). Art & Arcana inevitably comes up (13:50). Both the regular edition and the limited edition are on sale on Amazon. You can read more of Stu’s thoughts on the regular edition and the limited edition on the Insta. Hambone suggests the D&D 5E conversion of X1-The Isle of Dread from Goodman Games (17:38). We thought this one would be out in time for the holidays, but alas, it’s hitting shelves in January. You can pre-order it now, though and put a picture of the cover in a card or something. Or you could nab them Into the Borderlands. We wanted to plug the webstores of World Champ Game Co. and Bodie, but both their webstores are closed right now. Instead, why don’t you throw them a couple bucks on their Patreons: you’ll get some cool stuff every month (19:20). Hambone hits a couple quick gift suggestions (19:50) like Ghost Fightin’ Treasure Hunters and SRG Super Show Finally, every year, Hambone’s mom buys his a pound-o-dice from Chessex for Christmas, and that is pretty cool. See you in two weeks! * Correction: The singular of dice is die. After the opening banter, Hambone leads us off with the SRG Super Show, a card-based professional wrestling game (01:30). The main event arrives: Middle Earth Roleplaying, also known as MERP (08:27). Stu breaks down the dissonance between Tolkien’s work and MERP (10:32) and the weird timeline the setting uses (11:20). Stu explains how Iron Crown Enterprises got the Middle Earth license (12:00) and discusses ICE’s downfall (12:30). The MERP map of Middle Earth comes up (14:23) and Stu laments that fact that the game will never see the light of day again. They discuss the difference between the Star Wars Expanded Universe and MERP (15:30). Stu brings up the legendary critical hit and fumble charts (17:00). Stu makes some closing remarks (17:50). Stu talks about how excited he is about Ben Robbins’ Follow. (18:20) See you in two weeks! Hambone breaks it down (00:18). The guys start off with Ghost Fightin’ Treasure Hunters, a co-op board game about finding treasure in a haunted house (01:33). Stu explains how it reminds him of another co-op game, Flash Point, about fighting fires (03:03). Hambone talks a bit about the games two expansion (04:41). Hambone introduces the main course of our feast, D&D module I6 - Ravenloft (06:23). He declares it the best stand-alone module for D&D, though Stu disagrees (06:42). An unexpected hypothetical interlude about the 1979 cult classic film, The Warriors (08:38). Back on track. Hambone explains how much he loves the idea of a dungeon crawl through Dracula’s castle (09:55) and goes ga-ga over the maps (10:28). They discuss how experimental the module was for the time (12:00) and what kind of music Strahd is probably into (13:49). Stu breaks down how important Strahd is in terms of villain design (14:53). Hambone talks about how difficult it is to run Strahd as a master tactician (17:00). Curse of Strahd for 5E comes up (19:20). Stu offers his final thoughts on the module (21:00) and touches on House on Gryphon Hill, the sequel to Ravenloft (22:00). Castlevania: Simon’s Quest comes up (24:10) and Bram Stoker’s Dracula, too (25:34). Hambone briefly gets excited about Mixtape Massacre (28:00) and the guys say their farewells. * Clarification: Let’s talk dates. Ravenloft came out in 1983. House on Gryphon Hill came out in 1986. Castlevania came out in Japan in 1986 and North America in ‘87 while Castlevania II: Simon’s Quest came out in Japan in ‘87 and North America in ‘88. Judging from the art on the cover of Simon’s Quest, it is pretty clear that Ravenloft was at least on the radar of the videogame developers. It begins with a pizza joke, naturally (00:30). The guys talk about the Choose Your Own Adventure: House of Danger board game (01:15) and Stu breaks down the basics (01:46). They discuss the stupidity of group decision making (03:00) and where to get it (05:00). Conversation turns to the main event: Teenage Mutant Ninja Turtles and Other Strangeness (05:39). Stu admits to not being a TMNT fan (05:54) and Hambone sketches out the basic history of the franchise (06:20). Stu talks about the (07:09) original TMNT comic book series, which Palladium Books licensed almost immediately for an RPG (07:53). Stu recounts how Palladium’s license of Robotech led to the development of the TMNT cartoon and, ironically, the downfall of the TMNT RPG line (08:43). Stu talks a bit about the (complicated) TMNT RPG system, which is a component of Palladium’s Megaversal house system (10:55). He falls into the trap of trying to explain the Megaversal system and eventually gets to TMNT’s juicy center: the mutation rules and the After the Bomb campaign setting. (14:40). The guys talk about the rarity of the book (15:53), in particular the very first edition of TMNT and Other Strangeness that contained controversial mental illness rules (16:13). Cowabunga. Hambone gets excited about Pocket Dungeon Quest (17:20) and he walks through its charms (cloth map! )(17:45) See ya next time! (21:22) * Clarification: We tend to use “Choose Your Own Adventure” as a catch-all term for pick-your-path game books but, like iPods and Kleenex, that’s actually a brand name for the series published by Bantam Books in the 80s and 90s. The Marvel and Dungeons & Dragons gamebooks Hambone mentions were published by TSR (the latter known as the Endless Quest series). Correction: Stu is totally wrong, TMNT did not start off as a Daredevil pitch, it was a conscious parody of Daredevil (and also Ronin, Cerebus and New Mutants, apparently) from the get-go. The guys kick off by talking about the Werewolf party game (01:18). Stu briefly explains how the game works (01:45) and Hambone describes how they play it at their annual New Year’s party (02:20). Stu runs down the different roles that alter the game (03:11). Stu touches on the game’s negative reputation (03:43) and the guys discuss why it is a handy thing to have in your game arsenal (04:20). Planescape! Stu explains the initial aesthetic appeal of the campaign setting (05:25) and the basics of what it contains and how it works (06:10). The pronunciation of Sigil comes up (06:50). The Lady of Pain (07:35) and the factions (08:00) come up. In Planescape, ideas can change the multiverse (08:34). Hambone explains his first impression of Planescape (08:48) in the context of a larger on-going campaign. Stu talks about how his Planescape campaigns were his first real ongoing RPG campaigns (09:32) and why it works better than most D&D 2E campaign settings (10:08). Which isn’t to say there isn’t an Achilles Heel: while all the Planescape material is generally very good, there just isn’t enough of it (11:31). The biggest problem is the metastory, which eventually wraps up (in Faction War) with an unappealing and unsupported shift in the setting’s status quo (12:00). Discussion briefly turns to Planescape’s origins in Jeff Grubb’s Manual of the Planes and how the party in Stu’s game dealt with an Astral Dreadnought (13:30). Hambone gives his impression of the setting from the perspective of a DM running mostly introductory games (14:49) and Stu poo-poos D&D 5E (15:18) The guys nearly forget to mention one of the most important things about Planescape: Tony DiTerlizzi’s art (15:32). Stu waxes ecstatic and talks a bit on how Planescape’s aesthetic was developed (16:00). Final thoughts on Planescape collecting (17:21). (Note: we’ll be coming back around to Planescape in future episodes) Wrapping things up, Grant Howitt comes up again (see our previous episode on Masks of Nyarlathotep for more about his RPG Spire: The City Must Fall) with his hilarious one-page RPGs (18:29). See ya in two weeks (21:54)! * Correction: We call it Werewolf, but the Asmodee’s version (which we use) is called The Werewolves of Miller’s Hollow, and it retails for $13. Correction: Original Planescape material tends to be expensive and several later Planescape publications can be routinely found on the second hand market for astronomical prices (The Great Modron March, Dead Gods, The Inner Planes, Faction War and The Blood War box set). While Stu characterizes them as impossible to find at a reasonable price, he finally did – though it took like 20 years to do it. If you want them cheap sooner than that, grab them from DriveThruRPG as PDF or print-on-demand. Correction: The one-year collection of Grant’s one-page RPGs (13 games) is $30. Tongues wind up tied (00:44) as Hambone opens the episode and the guys talk about hard to pronounce fantasy names. Stu talks about a nifty two-player card game called The Blood of an Englishman, based on the fairy tale of Jack the Giant Killer (02:22) and admits the cover art sold him. It’s a little bit like head-to-head solitaire (03:04) mixed with chess (04:00). The guys discuss the pleasures of small games that are quick to play (04:40). On to the main event: Masks of Nyarlathotep (05:25). Stu breaks down some of the huge scope of the Call of Cthulhu campaign (05:46) and gives a rundown of what the scenario is about and its place in RPG history (06:34). He reveals the He-Man connection (07:10). They discusses how big and complicated a game it is (08:29). Stu gives a bit of background on how he set up the campaign with other Call of Cthulhu scenarios (09:50) and the guys discuss one of Hambone’s awful character deaths (11:00). Stu segues to discuss Chaosium’s expanded re-release of Masks of Nyarlathotep for the 7th edition rules (11:30) and talk turns to the fan-made Masks of Nyarlathotep Companion (11:53) and a Gen-Con adventure to secure a copy of it. Stu wonders what a Masks campaign would be like if Jackson Elias doesn’t die in the beginning (14:54) and Hambone asks if Stu could run the new version for the same group and not have it be boring and predictable (15:30). Hambone wonders how much experience someone needs to run the campaign (18:22). Stu moves on to talk about Spire: The City Must Fall, by Grant Howitt and Christopher Taylor, a game that reimagines drow as revolutionaries fighting to destroy the oppressive government that rules them (23:48). He loves it. Go buy it. See ya in two weeks (26:23)! * The scenarios Stu ran in the run-up to Masks were: “Tatterdemalion” (from Fatal Experiments), “The Haunting” (from the Call of Cthulhu 6th edition rule book), “Watcher in the Valley” (from Tales of the Miskatonic Valley), “The Gods of Mitnal” (from The Masks of Nyarlathotep Companion) and “Dead Man’s Stomp” (from the Call of Cthulhu 6th edition rule book). Stu mentioned some D&D campaigns that might prepare a game master for running something on the scale of Masks of Nyarlathotep. Off the top of his head: Night Below, Return to the Tomb of Horrors and the two part Planescape campaign contained in The Great Modron March and Dead Gods. These are all large scale stories that require a fair amount of NPC and mystery management that reward non-violent approaches to varying degrees. Still, none of them require quite the amount of clue-keeping as Masks. * Clarification: Boss Monster is for 2-4 players. Clarification: There is no right or wrong way to pronounce Nyarlathotep or any other made up fantasy/horror name. However you want to pronounce it, that’s the right way. If you want to really break it down, Nyarlathotep is probably “correctly” pronounced Nee-Ar-Lat-Ho-Tep, with a hard “t” and a distinct “h,” not a soft “th.” But you do you. Hambone kicks things off with a quick introduction (00:17). The guys get right to it and talk about a programing board game called Colt Express that they played the previous night (01:20). The focus of the episode is West End Games’ Star Wars RPG (06:08). Discussion starts with how completely Star Wars has penetrated popular culture (06:12) and Hambone gives a quick history of the game (06:48). Stu breaks explains how the RPG kept Star Wars alive. (07:40). The Ewok Movie comes up (08:20). Stu theorizes that the initial appeal of the Star Wars RPG laid in the fact that the books gave you access to more material from the movies (09:28). Stu explains the basics of the system (10:31) and explains how the game gave birth to the Expanded Universe (11:13). Timothy Zahn’s Thrawn Trilogy comes up (11:53) and Stu explains how those books paved the way to the larger Star Wars’ modern pop culture explosion (12:37). The Science Fiction Book Club comes up (13:22). Hambone runs through some of the publications dates and cover art for the various editions of the rules (13:50) and Stu voices his disappointment in the design and illustration in the third edition (14:18). Conversation turns to the game’s approach to universe building (15:00). They discuss adventure modules, the Kathol Rift campaign (16:38) and the Galaxy Guides, which brings the guys to the topic of toys (17:27) and the joy of weird aliens. There is the inevitable comparison to Star Trek (19:57) and that segues to a quick chat about angry Star Wars fans (20:54) and inclusivity (23:43). Stu talks about his up and down relationship with Star Wars (25:00). Hambone shifts the gears out of the heavy stuff to talk about how the game handles Jedi (26:30) and a digression into miniature play wraps things up (28:00). Finally, we end on a happy note, as Hambone is excited that his copy of the Big Trouble in Little China board game finally arrived (29:00) The guys say their good-byes (31:13). * Correction: Stu has a tick and keeps calling it the Star Wars Extended Universe. While that word usage isn’t wrong, the moniker is actually the Star Wars Expanded Universe. Hosts Stu Horvath and John McGuire welcome you back and layout the topics for Episode 3 (00:16). Hambone starts things off with Bill & Ted’s Excellent Board Game (01:16) and Stu drops a fascinating fact about Keanu Reeves (01:45). The guys introduce the main topic: West End Games’ Ghostbusters RPG (05:09). Discussion starts with fond memories of the movie (05:14), the cartoon (06:09) and toys (06:21). Stu breaks down the history of the Ghostbusters RPG (08:05) its weird connection to Chaosium (08:13) and how it forms the mechanical basis of West End’s Star Wars RPG by Greg Costikyan (09:06). Stu then talks about Timothy Zahn and the fallow days of the Star Wars franchise (10:00). Hambone then takes a deep dive into the contents of the box set (10:54) and the fun player handouts and movie callbacks found inside. Conversation turns to how awkward in-character dating is for the game master (16:00). Stu ruminates on simple systems, casual tabletop gaming and the different ways different people play (17:50). Finally, Hambone talks about how the box solves the biggest mystery of the Ghostbusters franchise: the ghost classification system (19:30). They wrap up with a quick rundown of the rest of the line and the cost of collecting the game (23:47). Finally, Hambone is excited about receiving his copy of Into the Borderlands, from Goodman Games (25:07) and Stu blows his mind with a fact about the playtesting of D&D 5E (26:13). Stu hopes that Goodman Games has success with their line of D&D reprints (27:13). Good-bye until next time (28:31)! * Clarification: Wilford Brimley was 51 in 1985, the year Cocoon came out. Keanu Reeves will be 54 on September 2, 2018 (early happy birthday, dude). Hosts Stu Horvath and John McGuire welcome you back and breakdown what’s coming up on Episode 2 (00:19). Stu explains his recent obsession with Azul, a deceptively complicated board game about building mosaics (01:20) and John updates us on where in the world his Big Trouble in Little China board game is. The main discussion starts (07:50) with Stu explaining why he loves Call of Cthulhu and fawns over the greatness of Chaosium. They pull out the first edition Call of Cthulhu box set and drill down into specifics (10:30), charting the games development from RuneQuest and Basic RPG (11:00) and the game’s power dynamics (12:00). John describes some of the grisly ways his characters have died in Call of Cthulhu (15:40) and discussion turns to the fragility of the game’s player characters (18:26). Stu breaks down the differences between the different editions of the game (19:00). Stu also talks about Gene Day, the late comic artist who illustrated the first edition Cthulhu box (22:04). The guys then chat about the titles of people who run games (23:20) and delight at CoC’s nomenclature. Finally, Stu and John discuss how they finally have a regular RPG night again and chat about the first game they’re playing: Tales from the Loop, a game inspired by Swedish artist Simon Stålenhag (25:59). The guys bid your farewell until next time (28:47).